As I mentioned in my previous post I have spent a good part of today sorting through my new Moulin Roty order, and it has been a really lovely thing to do. 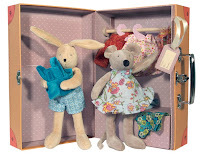 There have been lots of new products and I think my overall favourite is 'La Petite Armoire', a sturdy cardboard wardrobe containing soft toy mouse and bunny and a whole array of lovely clothes for them to wear. It is delightful. At £50 it is without doubt an expensive and special toy, but to my mind it is worth considering, and - as my previous posts reveal - I am writing as a woman living on a very tight budget indeed! I am going to be writing more about this in the coming days and weeks - on here as well as letters all over the place - but I believe passionately in the concept of buying one or two special, enduring toys over a whole array of plastic, disposable stuff, and to my mind this lovely Moulin Roty play box is an ideal candidate..
For £50 you get two well made soft toy animals from one of the best contemporary toy makers in the world (a lovely little mouse and a bunny), a very solid and durable 'wardrobe' complete with lovely interior, coat hangers and little wooden hanging rail, and a fab selection of clothes for the little toys to wear. There is so much to do and play with and it is, undisputably, a toy to treasure. In this one package there is so much potential for creative play - and what a lovely item to keep, and to remember your little one playing with. There is no doubt about it, we are knee deep in a recession and we all have to tighten our belts, but I honestly believe (and this is something I feel SO passionately about) that we are better off spending what little money we do have on one or two really special items, rather than buying a selection of stuff we might chuck in the bin next week. As I say, I am going to write more about this because it is something I really believe in. 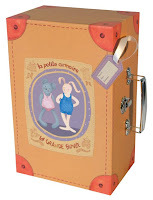 But for now this lovely Moulin Roty toy is a super example of the kind of thing I am thinking about! I quite agree.....lovely first baby gift....My niece has something like it.....except its a doll and her dog...she has brought them here to play today....she is now 6 and has had them since she was baby! They look just as good now and have given yrs of fun-something to pass down to the next lot of littles! I think you're right about investing in something good quality. We went in with both sets of grandparents to get my eldest a little wooden house last year rather than a plastic one. Hopefully it will last a long time! Thanks so much for your lovely message, I am so nervous!!! Glad you like the name, I hadn't even thought about it being early on in the alphabet. I am terrified I will be lugging the whole lot back home again though! Your shop looks absolutely lovely! I so agree with buying the best quality that you can in lovely materials rather than lots and lots of plastic stuff (why is that the little ones end up with so much of it?) I for one try to buy nice, unusual things as gifts (or sometimes try and make something myself!). My little girl has a couple of the Moulin softies and they are just gorgeous! My mum lives in Broadway, not far from you, so I will try and visit one day ~ your displays look very tempting!